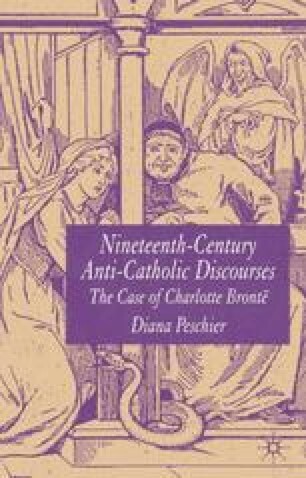 One distinguishing feature of anti-Catholic feeling during the nineteenth century was a widespread fear of Catholic religious institutions, and in particular female religious institutions. Many single women regarded the convent as a plausible alternative lifestyle. Such an alternative necessarily challenged the Victorian patriarchal emphasis on the family as the core of society. This meant that convent-living tended to become ideologically constructed as ‘unnatural’. To deny a woman her ‘natural’ destiny of wife and mother was deemed a terrible offence. In her analysis of a nineteenth-century women’s religious congregation, Gloria McAdam makes the point that whilst the nun represented an alternative to the established understanding of female gender and sexuality, she was consistently subjected, by men, to a gendered interpretation.2 It is this ‘gendered interpretation’ of the nun in nineteenth-century literature that will be explored in this chapter, through the examination of various different approaches to the subject, both fictional and non-fictional, published during the mid-nineteenth century. In England the friends of the most abject criminal, or the most delirious maniac may gain uncontrolled access to certify that she is treated with kindness and propriety, besides which indispensable protection, the inmates of a prison, or a lunatic asylum, have the inestimable privilege of being occasionally visited by the authorised crown officers, to take legal proof that they are either justly or willingly incarcerated; but a convent is the only spot in her majesty’s wide dominions to which the law of British Liberty does not extend.